How Do We Instigate the Change We NEED to Truly Be Innovative? 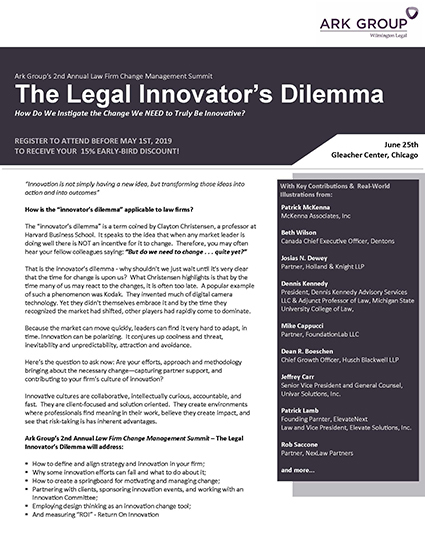 Jeffrey Carr, Senior Vice President and General Counsel, Univar Solutions, Inc.
Patrick Lamb, Founding Parnter, ElevateNext Law and Vice President, Elevate Solutions, Inc.
How is the “innovator’s dilemma” applicable to law firms? The “innovator’s dilemma” is a term coined by Clayton Christensen, a professor at Harvard Business School. It speaks to the idea that when any market leader is doing well there is NOT an incentive for it to change. Therefore, you may often hear your fellow colleagues saying: “But do we need to change . . . quite yet? That is the innovator’s dilemma - why shouldn't we just wait until it's very clear that the time for change is upon us? What Christensen highlights is that by the time many of us may react to the changes, it is often too late. A popular example of such a phenomenon was Kodak. They invented much of digital camera technology. Yet they didn't themselves embrace it and by the time they recognized the market had shifted, other players had rapidly come to dominate. Because the market can move quickly, leaders can find it very hard to adapt, in time. Innovation can be polarizing. It conjures up coolness and threat, inevitability and unpredictability, attraction and avoidance. Here’s the question to ask now: Are your efforts, approach and methodology bringing about the necessary change—capturing partner support, and contributing to your firm’s culture of innovation? Innovative cultures are collaborative, intellectually curious, accountable, and fast. They are client-focused and solution oriented. They create environments where professionals find meaning in their work, believe they create impact, and see that risk-taking is has inherent advantages. Internationally recognized author, lecturer, strategist and seasoned advisor to the leaders of premier law firms, Patrick has the honor of working with at least one of the largest firms in over a dozen different countries. He is the author of eight books most notably his international business best seller, First Among Equals, currently in its seventh printing and translated into nine languages. His most recent work, The Changing of the Guard, Second Edition (Ark Group, 2017), provides in-depth guidance on the leadership selection process in professional firms. Patrick’s three decades of experience led to his being the subject of a Harvard Law School Case Study entitled: Innovations In Legal Consulting (2011). One example of that innovation was his launching the first instructional program designed to specifically address the issues that new firm leaders of larger firms face in their First 100 Days – which has thus far graduated over 80 new leaders many from AmLaw 100 and 200-sized law firms. Patrick serves as Contributing Editor to Of Counsel, The Legal Practice and Management Report based in New York City; is the recipient of an “Honorary Fellowship” from Leaders Excellence of Harvard Square; was voted by the readers of Legal Business World as one of only seven international Thought Leaders (2017); and is founding member of the Legal Institute For Forward Thinking a legal think-tank comprised of leading academics and consultants from three countries. Founding Partner, ElevateNext Law, and Vice President, Elevate Solutions, Inc.